Welcome to the Fallsview Mini Mart and Dollar Store. A truly convenient store! One block from the Falls, adjacent to the new Fallsview Casino, the Mini Mart has over 100,000 items. Located within the Best Western Fallsview on Fallsview Blvd Niagara Falls Ontario, the Fallsview Mini Mart and Dollar Store is situated in the heart of the Fallsview Tourist District making the Fallsview Mini Mart and Dollar Store walking distance from any hotel. Not staying at the Best Western Fallsview? Shame on you! But you can still shop at the Mini Mart. We are conveniently located in the heart of the Fallsview Tourist area and welcome guests from the surrounding hotels that have no desire to pay too much for the same items in the gift shop at their hi Rise hotel. The day is suddenly hotter or colder than you planned for? Or it's raining? We sell bathing suits, sweat shirts, hoodies and umbrellas. From trinkets to china, we have a huge selection of souvenir items. 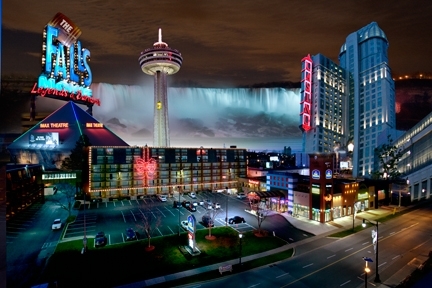 Take home a reminder of your wonderful stay in Niagara Falls! We carry most sundry items including film, cameras, batteries, toiletries, room spray, cosmetics, baby food and diapers. Pick up coffee, muffins, juice, cereal and milk here at the Mini Mart. Fill your cooler for the day to take back to your room or for your trip home. Don't have a cooler? We sell those too. We also sell bags of ice. We have fast food, sandwiches, snacks, chips and dips, chocolates, maple sugar products, ice cream, candy, water, soda pops, cereal and milk, energy drinks, chocolate milk, and pastries. Why leave your furry family members at home? The Best Western Fallsview is a Pet Friendly hotel. Forget to bring Fido's favorite toy, or his blanket? Staying an unexpected additional night and need breakfast for the morning? Not to worry, we have an extensive selection of pet supplies for your cat or dog to make their stay in Niagara as comfortable as yours. In the unlikely event that you need something we do not have, we will send you in the right direction to find it. So come on over and browse our selection. Hours vary seasonally, open 24/7 during peak season. Call for hours of operation.